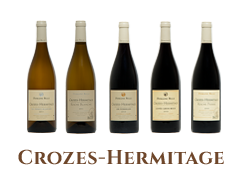 The enormous richness of the Domaine lies in the diversity, the complexity and the quality of its exceptional terroirs. This soil is composed of white limestone clay also known as Kaolin. The vines can root to great depths to seek out the minerals they need for healthy growth. Larnage is the only commune in the Croze-Hermitage appellation to benefit from this type of soil. Granite is a rock made up of small quartz and feldspar crystals, which breaks down and cracks, leaving a red-brown gravel on the surface. This type of soil can be found in Larnage, Crozes and Tournon. Terraces of rounded pebbles (galets), worn smooth by the Rhone and associated with red clay soils are found In the commune of Pont d’Isere in the south of the Crozes-Hermitage appellation. These different soil types, together with the grape varieties in our appellations, Marsanne and Roussanne for our white wines and Syrah for the reds, allow us to produce cuvees with their own distinct flavour profiles and tannin structures. Our routine pursuit of low yields (20 to 40hl per hectare) leads us to practice close pruning and the very moderate application of organic manure. Rigorous viticultural practices (mechanically working the soil, reasoned use of natural phytosanitary treatments, leaf thinning, green harvesting when necessary, and manual harvesting) allow the full quality potential of the varieties to be brought to the fore. 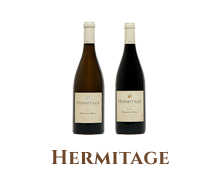 A favourable micro-climate allows the grapes to reach a perfect maturity and an excellent quality before harvesting.